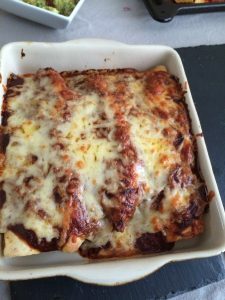 Having just returned from holiday in Mexico, we fancied cooking a favourite from Supercook – Costillas a la Mexicana, which is Mexican pork chops. Garlic is rubbed over the chops and they are refrigerated while the Salsa Mexicana is made. Chillies, tomatoes, onion and garlic are chopped and blended and salt added. The chops are pan-fried and the sauce is poured over at the end. We served with tortillas. 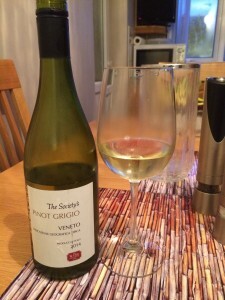 We tried a bottle of the excellent Ravenswood Zinfandel, but we quickly decided this didn’t work and switched to an Italian white – The Society’s Pinot Grigio 2014, from the Wine Society. We detected a slight pineapple sweetness with flavours of tropical fruits and nectarines. A good wine and a good match with the pork. 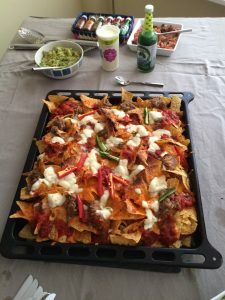 We cooked an old favourite from Supercook and had forgotten how delicious this recipe is. It’s called pork chops with mustard sauce. The pork chops are seasoned with salt, pepper and paprika and served with a sauce made from shallots, garlic, mushrooms, French mustard and double cream. We served with sauté potatoes and green beans with melted garlic butter. 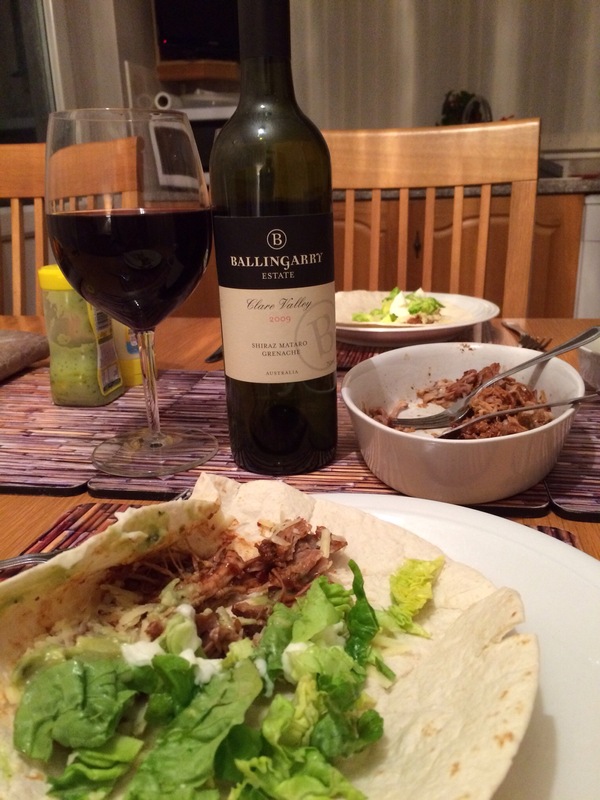 We paired this superb meal with a bottle of Arabella Cabernet Sauvignon 2013, a full-bodied red from Naked Wines. 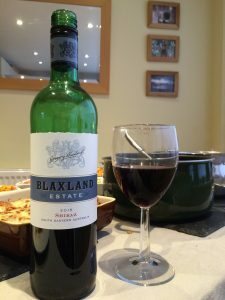 We detected black fruits on the nose and flavours of sweet chocolate, blackcurrants, and plums, with an intensely savoury, smooth, slightly spicy finish. We even detected coffee notes. This lovely wine was an excellent match with the pork. 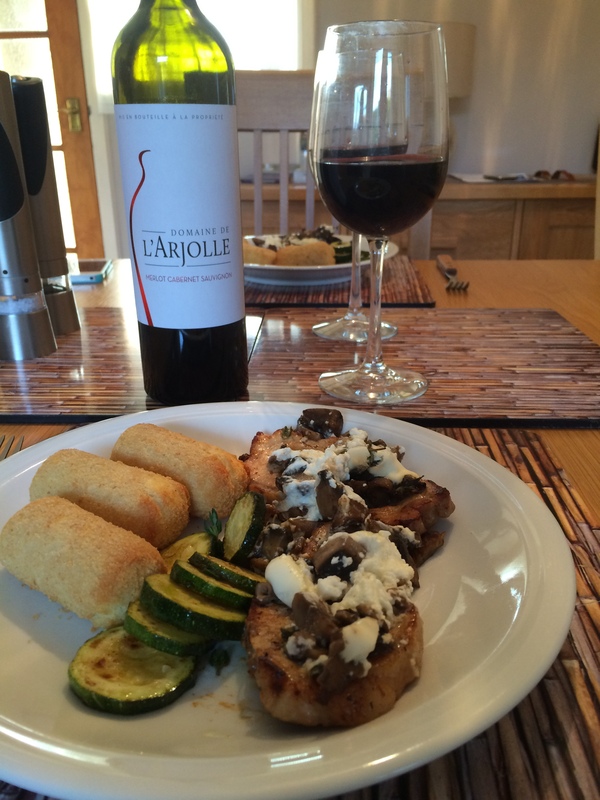 In the tasting notes that came with Domaine de l’Arjolle Merlot/Cabernet Sauvignon 2012, the Wine Society suggested it would make a perfect pairing with Delia’s Pork Chops Baked with Wild Mushrooms and Crème fraîche, a recipe we have tried before. Pork chops are fried in butter and cooked with dried porcini mushrooms, Crème fraîche, fresh thyme, open-cap mushrooms, lemon juice, flour and salt and pepper. We served with grilled courgettes and croquette potatoes. The medium-bodied Southern French red blend displayed red fruits on the nose, vanilla sweetness, red berries and cherries with a nice acidity on the finish. 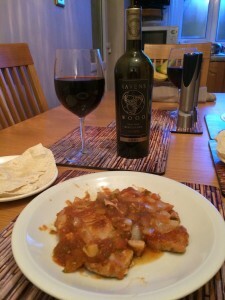 We agree with the Wine Society that the wine is an excellent match with Delia’s pork chop recipe. See here for a previous pairing with this wine. 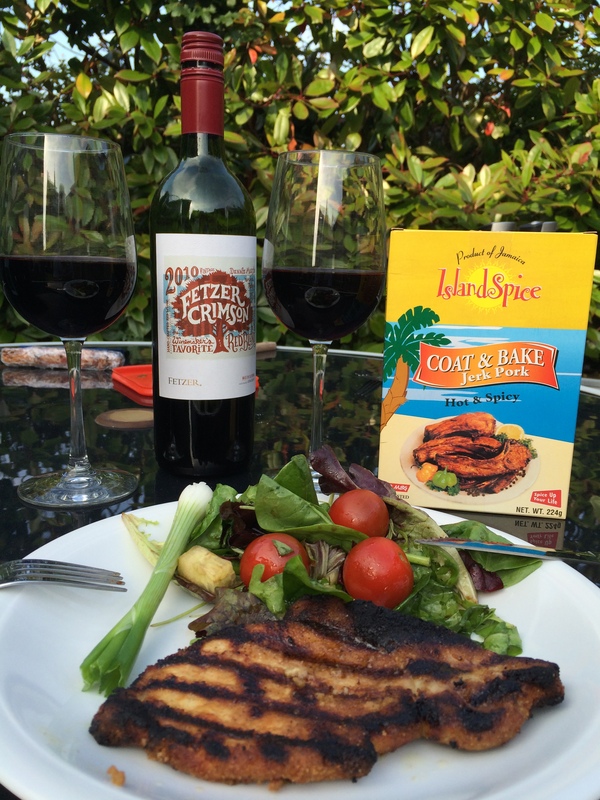 We visited Jamaica a few months ago and brought back with us some Island Spice Jerk Pork rub. The rub contains corn starch, crushed pepper, Jamaican pimento, garlic, onion, breadcrumbs, black pepper, salt, sugar, cumin and Jamaican scotch bonnet pepper. 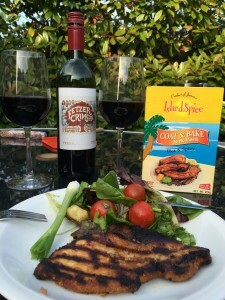 We coated some pork chops in the rub, grilled them on the barbecue and served them with a mixed green salad. We thought the pork was reasonably tasty, but didn’t think it was especially hot as indicated on the packet. 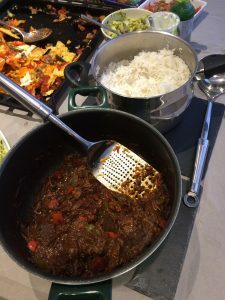 We paired the food with a bottle of Fetzer Crimson 2010, a medium-bodied Californian red blend from Tesco made from Zinfandel, Syrah, Cabernet Sauvignon, Durif and Petit Verdot. An enjoyable, easy drinking wine that delivered mixed red and black fruits, with a warm spiciness. 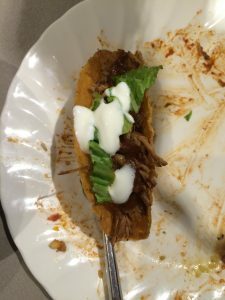 It was a good match with the pork. We bought some Wolf Berner Sausages from Costco. 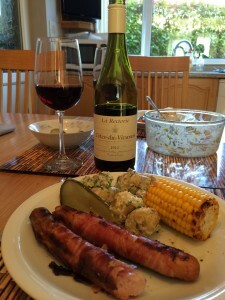 These are frankfurter-style sausages stuffed with Emmental cheese and wrapped in bacon. We decided to grill them on the barbecue and serve with a potato salad, corn on the cob and pickled gherkins. The sausages were alright, but a bit salty for us. We also didn’t detect much cheese. We paired the meal with a bottle of La Rectorie Côtes du Vivarais 2013, a medium-bodied Southern French red blend from Waitrose. The wine had a perfumed nose, with red fruit flavours and a slightly spicy finish. An easy drinking wine that was a good match with the food. 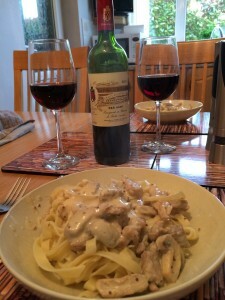 A few months ago we discovered three Pork Stroganoff recipes online and wine pairings with the first two can be found here and here. 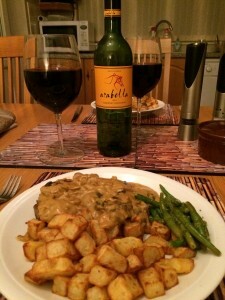 This one is Pork Stroganoff with Three Mustards from Delia online. Sliced pork is cooked in a sauce made from mustard powder, grain mustard, Dijon mustard, mushrooms, Crème fraîche, onion, dry white wine and seasoning. We served with tagliatelle rather than rice. 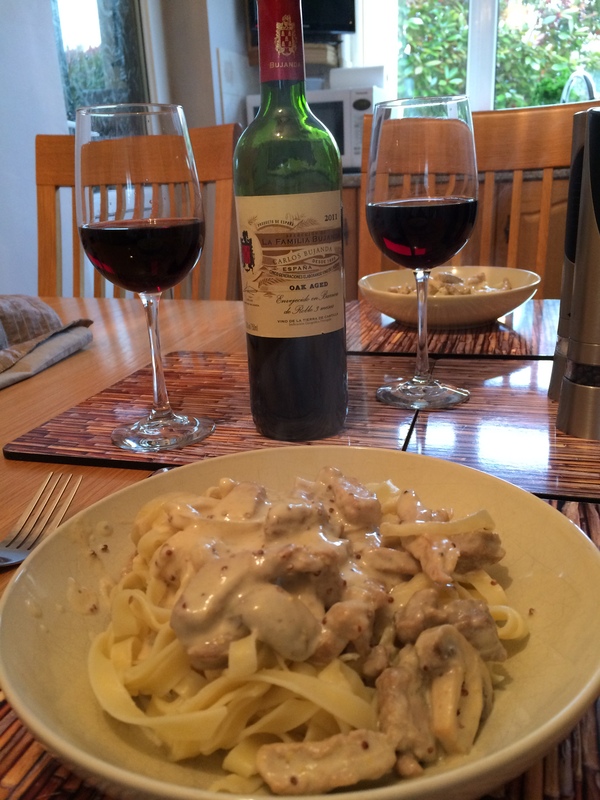 Our verdict on this Stroganoff is that it is better than Mary Berry’s but not as enjoyable as Jo Pratt’s. We paired the meal with a bottle of Seleccion del la Familia Carlos 2011, a medium-bodied Spanish Tempranillo from the Sunday Times Wine Club. We detected red fruits and spices on the nose and this was followed by vanilla sweetness, spiciness, strawberries and red cherries on the palate, with a smooth finish. 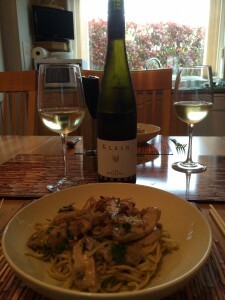 A very good match with the Pork Stroganoff. 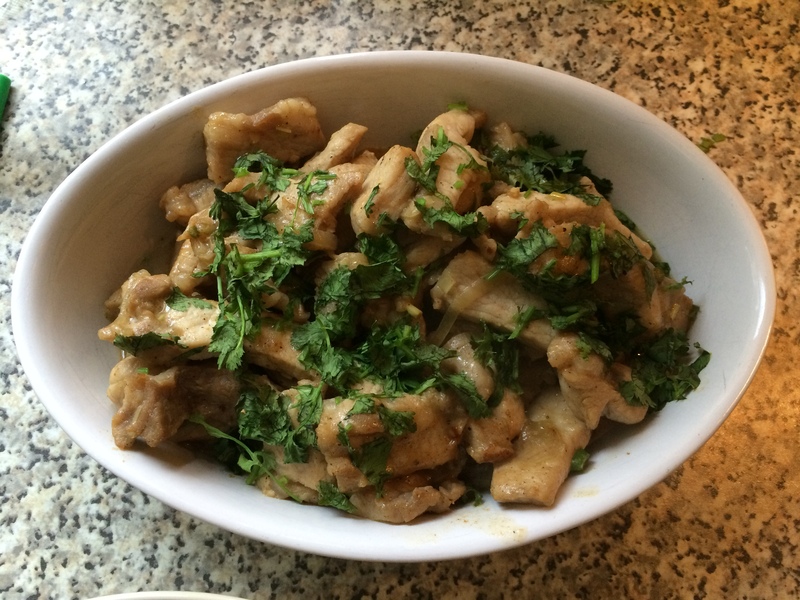 We tried Vietnamese Pork with Lemongrass from Madhur Jaffrey. Sliced pork loin is marinated in soy sauce, fish sauce, lemongrass, shallots, green chillies, black pepper, sugar and hot curry powder. The pork is then stir-fried with shallots and garnished with coriander leaves. We served the pork with prawn crackers and egg noodles stir-fried with garlic, ginger, chilli, fish sauce and chopped coriander. We thought the noodles competed a bit with the flavours of the pork, so served the leftovers with plain noodles, which was better. We paired the meal with a bottle of Klein Riesling 2013, a German white from Naked Wines. The wine was off-dry with crisp, fresh, tangy, citrussy lemon and grapefruit flavours. 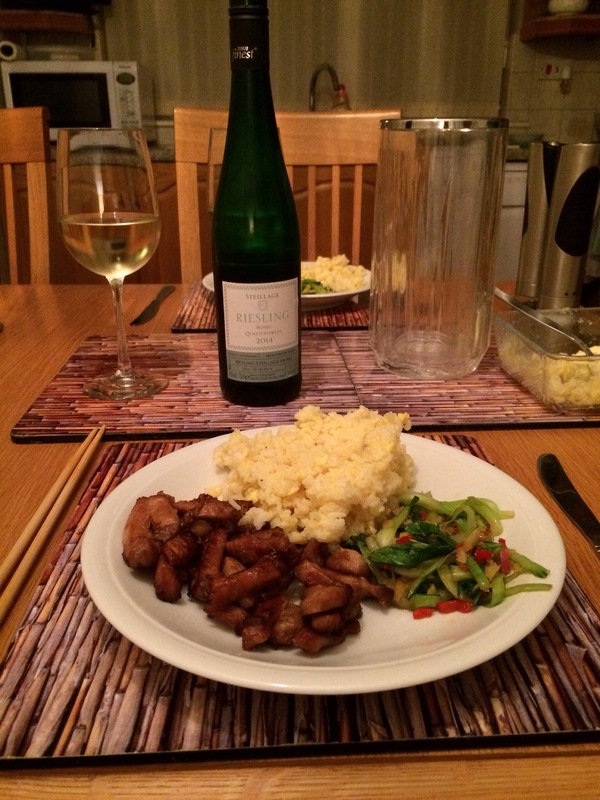 A very good match with the pork.